Sanofi’s track record of creating effective solutions for people living with diabetes has lead to the development of the BGStarTM, a blood glucose monitoring device with the tools and a support system to put in control of the diabetes and not the other way around. 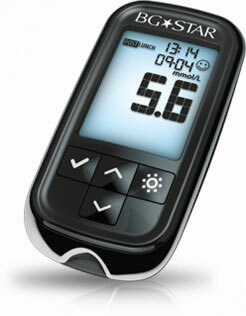 Checking the blood glucose with the BGStarTM couldn’t be simpler. Insert a test strip with the contact bars facing up. Use the lancing device to obtain a blood drop then touch the end of the test strip to the blood drop. A beep confirms a correct reading and a scrolling bar indicates that the meter is calculating the readings. No coding eliminates the risk of inaccurate readings due to miscoding, and the BGStarTM requires only a small blood drop, helping to reduce multiple finger sticks. The BGStarTM has a large, easy-to-read backlit display in a sleek, compact design for discrete measuring. A smiley face icon clearly indicates when placed in the proper range. The data is displayed quickly, and a visual countdown and a beep let to know when the reading is done. It’s a straightforward process that takes an average of 6 seconds.